Keep your furry friend healthy and happy with Nulo Freestyle Grain Free Freeze Dried Raw Dog Food! It’s all the benefits of raw without the hassle. Containing 80% or more animal sourced protein to give your pup all the nutrition that he needs to look and feel his very best plus wholesome cranberries! These freeze dried bites are minimally processed and quickly frozen to lock in the most nutrients and flavors possible. Made with no wheat, corn, soy, artificial preservatives, colors, or flavorings. 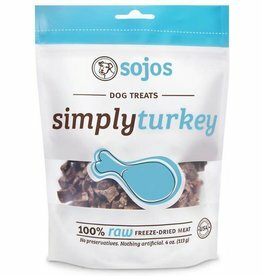 Ingredients: Turkey, Turkey Necks, Turkey Heart, Turkey Liver, Cranberries, Apples, Sweet Potato, Broccoli, Carrots, Kale, Spinach, Parsley, Apple Cider Vinegar, Ground Flaxseed, Dried Kelp, Inulin, Salt, Dried Bacillus coagulans Fermentation Product, Potassium Chloride, Salmon Oil, Zinc Proteinate, Iron Proteinate, Mixed Tocopherols (natural preservative), Vitamin E Supplement, Copper Proteinate, Manganese Proteinate, Vitamin D3 Supplement.